Agaves are originally from North America, the Southern states of USA and Mexico. They are monocarpic, they flower once in their lifetime and then die, however they do set seed and even put out offshoots to form clumps, so in fact propagation and ongoing display of foliage is not a problem. Agave monacanthus is an interesting species, pictured right. Increasingly popular as an ornamental plant in the Australian garden they are used extensively by landscapers in courtyard situations both in the ground and in pots. A well drained soil and full sun best suits agave, and a feed of slow release fertilizer four time a year is beneficial to growth. Agaves suit the modern courtyard look, with strong structural lines, they can look great in terra cotta style pots. With over 200 species including variegated forms the choice is wide. Advanced specimen plants are available as are smaller plants, offsets and tubestock. Other popular species including, Decipiens, Desmettiana, Diffusa, Obscura and Xylonacantha which are all widely used in landscaping where low maintenance and drought tolerant plants are required. Growing conditions for Agave and Agave care. Agave like most succulents are sun loving, and are generally regared as drought tolerant. Like yuccas, agaves require very little maintenance. Removal of spent flower heads, occasional watering and fertilizer application evry month or two will keep your yucca in good condition. 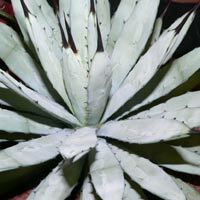 Although Agave are a hardy plant and in the ground are reasonably drought tolerant, Agaves are a hungry plant especially the larger species and cultivars. They can quickly become pot bound, they can be root pruned, but are better potted up as they exhaust the potting mix and fill the pot with roots. This is why they will also need watering during dry spells. So be a little careful with varieties, species and types. Look for factual information on plant tags. For example, Agave americana var. americana is a larger growing species while Agave americana ‘Medio-picta’ is much smaller. Agave parviflora is one of the smallest species while Agave gentryi is one of the largest. Agaves can be gown indoors if you follow a few basic rules. Basically agaves are a a dry climate plant used to growing in hot conditions, lots of light and little water. Growing indoors can easily meet the hot and dry conditions it is the light that is the main problem. When we try to grow these wonderful succulents indoors it is usually a lack of light and poor air circulation that cause the problems. The other issue is a tendency to over water. So look for a position with lots of light, make sure you use a free draining potting mix , but do remember to allow to almost dry out between watering, usually no more than water once a week in a warm house. Fertilizer is generally not required, and in fact is usually avoided, except for a 1/2 application as they commence new growth. Agaves can be propagated by division which is the removal of offsets or ‘pups’ or from seed. Removing the offsets is easy, just remember to retain the small stem that connected the offset to the main plant, this is the part that will have some roots and will send out new roots. The offsets ( with roots )should be planted immediately into good potting mix and fertilised with a liquid fertiliser. Agave have become an important plant for landscapers, with strong architectural shapes agaves make a dramatic statement in the garden. Grown in a pot agaves can make great specimen plants, planted in mass or as a border the impact of agaves can be dramatic. With over 350 species originating in Mexico and Southern USA you can find an agave for any situation. Agaves will flower, and they have great flowers, but be patient, agaves may take 5-10 years to flower. Agave attenuata is a very popular variety, but look for varieties such as agave desmettiana ‘el miradores gold’ a stricking plant. Agaves will grow up 1.5m, agave americana species. However lower growing or dwarf species may only reach 30cm, agave victoria regina, agave univtata and the interesting form agave toumeyana.